Most of this walk was off track and included negotiating a bit of scrub, including Scoparia, and a fair bit of uneven terrain underfoot. Initially the track to Mt Field East was followed and I was able to point out the work done by the Friends of Mt Field on hardening the track . On the highest part of the saddle at the top of the climb and before windy Moor we turned northwest and walked through a lovely area of bushes with open space between them that made walking easy. 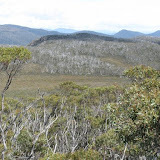 A gentle climb brought us to an unnamed rocky knoll that was actually higher than nearby named features including Mt Crooke, our walk destination. The descent brought the first unavoidable scrub, including some Scoparia in flower. Beyond this we entered the valley holding the headwaters of the Davis River and then began the 45 minute and 900 metre walk through the scrub for an ascent of a mere 100 metres to the summit of Mt Crooke.